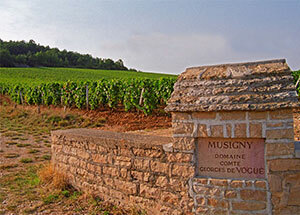 Comte de Vogue is world famous for its Musigny and Bonnes Mares Grands Crus and the Premier Cru Les Amoureuses from the vineyards situated around Chambolle Musigny in the northerly part of the Cote d'Or of Burgundy. These wines are in huge demand worldwide and command very high prices. Remarkably, this domaine can trace its history back 550 years and it is now the 20th generation of the same family in charge.